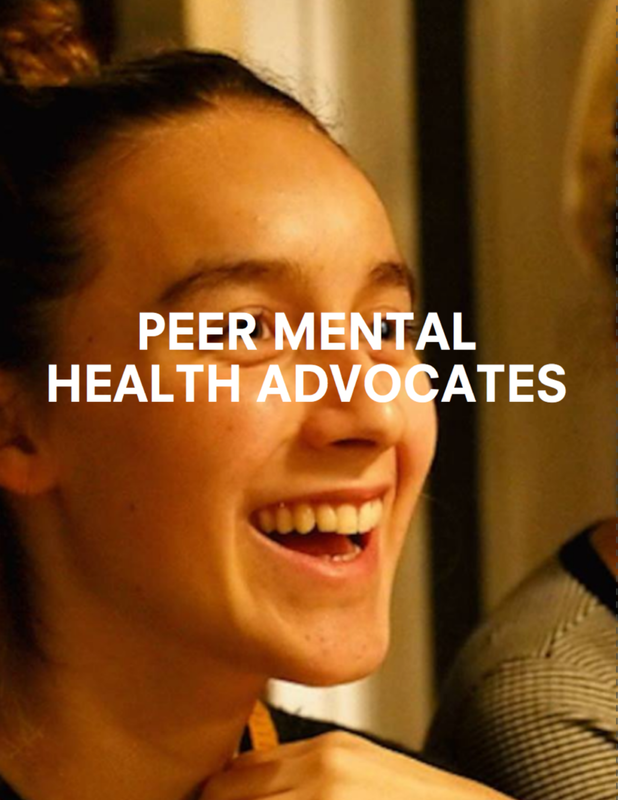 The Peer Mental Health Advocate (PMHA) model was developed by Project LETS -- based on core foundations and principles of Certified Peer Recovery Specialist curricula, and Intentional Peer Support. On Sunday, December 6th, 2015, Project LETS at Brown University officially launched the PMHA program, a peer support service for students living with mental health issues/mental illness, disability, trauma, and/or neurodivergence (or, for students who just need some support -- no labels necessary). PMHAs are students who have lived experience of mental illness, trauma, disability, and/or neurodivergence, and work one-on-one with students in long-term peer support and advocacy partnerships. Succeeding in a higher education institution that is both academically and socially demanding is hard work; add in the management of mental health issues and it can get even more difficult. 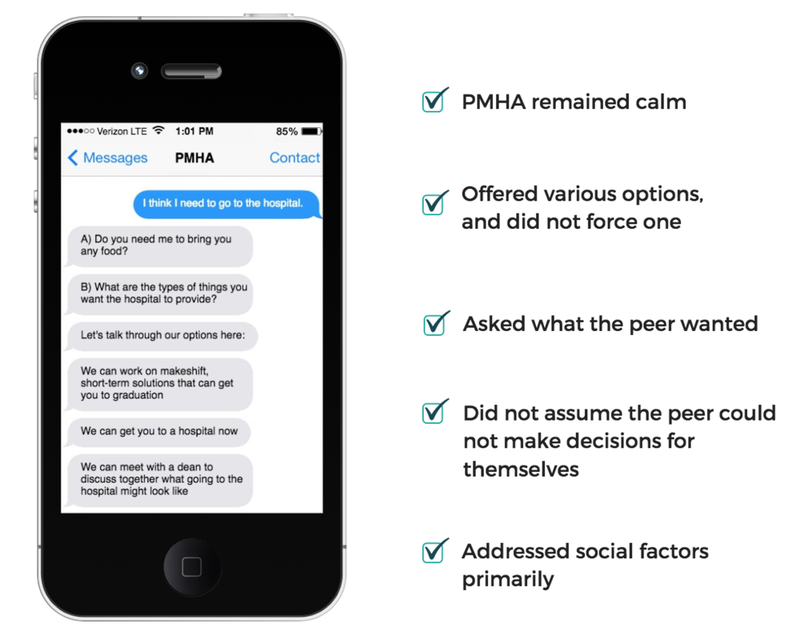 PMHAs have been through it, and want to make the process a little easier for others. 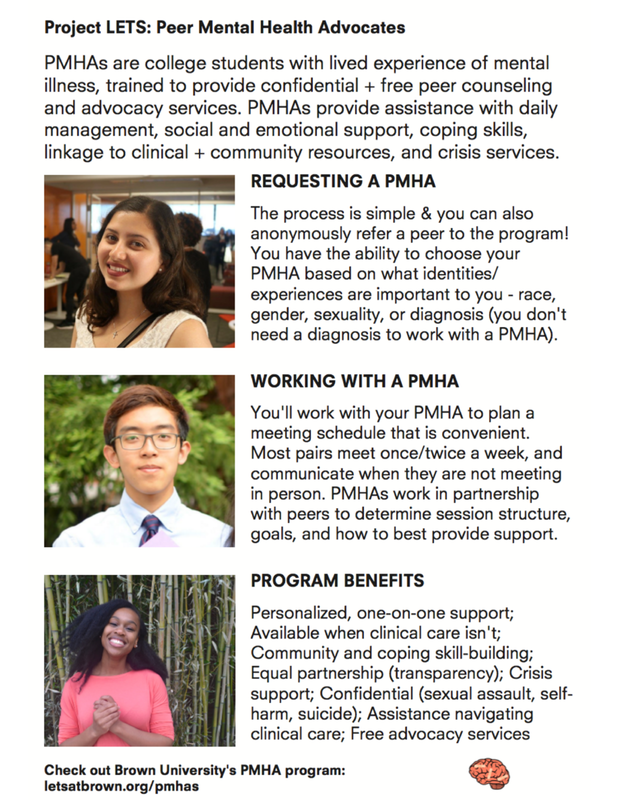 PMHAs are trained to assist students through the process of seeking adequate mental health care, while remaining mindful of financial barriers, cultural barriers, and myriad other factors that can prevent access to some forms of treatment. PMHAs can help students find a competent, affordable therapist, connect with a psychiatrist, or access credible resources and information, if therapy isn’t an option. The student dictates the course of action for the semester, and the PMHA will help complete tasks and work towards whatever the student is trying to attain. Regular meetings allow PMHAs to create a space where their peer can more freely discuss issues of mental health. These meetings may also allow PMHAs to facilitate relevant conversations that acknowledge mood fluctuation and changes in symptom presentation, identify social and academic stressors, and address students’ short-term goals and accomplishments. PMHAs are not therapists (they do not assess or diagnose)-- they’re educated students with lived experience, and every PMHA knows to address this distinction by establishing clear boundaries with their mentee. If a student is having a tough week and their mental health is impeding their academics, they may have difficulty reaching out to all pertinent campus resources for assistance. For example, a student who is experiencing a bout of depression, with side effects of intense fatigue and inability to concentrate, may not have the time or energy to make multiple phone calls to the various administrative departments that could provide academic support. Even emailing professors to address the aftereffects of a flare-up can be emotionally taxing for some students with mental illness-- they may feel that, in order to be taken seriously, they are obligated to disclose medical information and apologize for their symptoms. In a situation like this, a PMHA could advocate for the appropriate adjustment of academic deadlines, connect the student with a dean, and help them to communicate with administrators and professors. Crafting emails and making phone calls on their peer’s behalf can free up time for the student to fully focus on recovery; still, PMHAs do not take any action without student approval. For students with families that stigmatize therapy, meeting with a peer mentor might feel more approachable than a therapy appointment. For many people, due to race, class, sexual orientation, gender identity, and culture it can be too risky for them to use their voice and speak up if they have a mental illness. Some people's disorders make them too paranoid to talk to a professional. Some people are scared of the possibility of seeking support from an institution. Some people have or believe they have disorders that are incredibly stigmatized. Being able to talk to other mentally ill people is essential in management and healing. Project LETS believes that every person has a right to access good mental health care-- and recognizes that what constitutes “good mental health care” is entirely dependent on individual needs. In establishing the PMHA program, we aim to ensure that students will receive adequate, accurate, and relevant information from experienced students who can appropriately facilitate conversations about mental illness. Every PMHA has completed a 16 hour training program in order to meet this standard. Our program aims to address the barriers that many students face when seeking mental health care, and provide students with a support system to help break down those barriers. Learn more about peer support.